“Some people look for a beautiful place. Others make a place beautiful”. 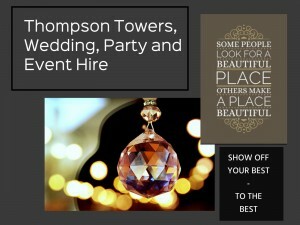 We have a wide range of quality hire products available at Thompson Towers Wedding, Party and Event Hire. We invest heavily in our products and are renown for the quality of our backdrops, all of which have the lights sewn into the velour cloth and are truly stunning. Don’t just take our word for it, take a look at our gallery, which can be found in our menu tab above and see for yourselves how we can transform a room into a “beautiful place”. We tailor our packages to suit your individual requirements and cater for all budgets. We pride ourselves on the quality we can provide and will work closely with you to create your very own bespoke package. 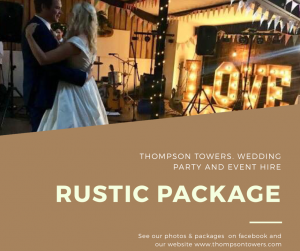 We have a wide range of products that are being updated all the time so, it would be impossible to list everything we can do so please take a look at some of the packages we offer and remember we can tailor these to your own specific requirements, for your wedding, party, event or celebration. Create a truly magical wedding backdrop with our romantic 4FT rustic Love letters. They are made from reclaimed pallet wood and add a true rustic charm to your wedding day. They are soft bulb lights emitting a warm romantic glow. Add some luxury and little sparkle into your wedding day with our beautiful velour fairytale backdrops. They span 6M x 3M and cover dull and boring spaces in any venue. They have all the lights sewn into the material, are not just hung behind a thin see through curtain. 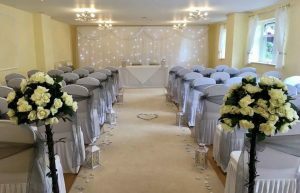 The voile overlays and swagging provide a magical charm and can be used during your ceremony and then placed behind your top table. During the evening the LED sparkling star curtain makes the perfect backdrop behind your dance floor just in time for your first dance. This set comes with a top table and cake table skirt to match – simply elegant and stylish! 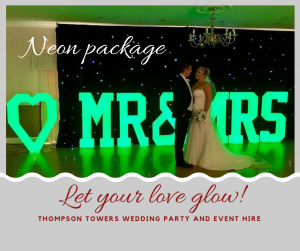 At Thompson Towers we love a ‘happy ever after’ so why not start yours by hiring our fabulous, unique and versatile 4FT colour changing LED letters/symbols and make a statement on your special day! Inject that ‘WOW’ factor and create the perfect finishing touch your venue. These letters can change to compliment your colour and theme but also can be placed on a slow strobe at night for your evening entertainment. They look stunning on a stage in front of one of our twinkling star curtains. They make the perfect backdrop for your wedding photos and light up your dance floor with a warm glow at night. 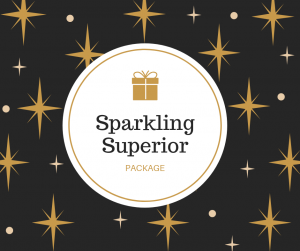 This exclusive prestige styling package includes a ceremony set so the twinkling backdrop that comes within the package can be used during the ceremony and moved after and placed behind your top table. We do work closely with our clients to make sure everything is just right and matches your vision for your special day! We pride ourselves on the quality products and services we provide.